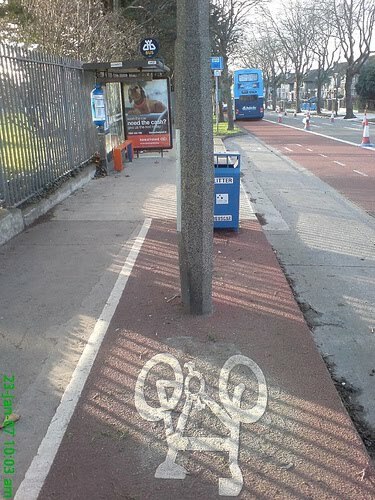 A typical Dublin bike lane! The other morning, for the first time, I was told by a Garda to get off the road and on to a bike lane. He found it necessary to flash the blue lights on his van while he was telling me so it was all very official! (a) Subject to paragraph (b), a pedal cycle must be driven on a cycle track where one is provided. (iii) where a vehicle is parked in the cycle track for the purpose of loading or unloading. However, in my circumstances, and in the case of many, many other cycle lanes throughout the city these regulations bear no relation to reality. On the occassion in question I was cycling up Mount Merrion Ave when the Garda moved me off the road. Let me describe the scene. Mount Merrion Avenue starts at Blackrock. The first section is flat and narrow. Cars are parked on the left and traffic is forced very much towards the inside due to the narrowness of the road. No seperate provision has been provided for cyclists who have to constantly avoid wing mirrors on both sides and frequently have to slow to avoid being run into parked cars or the side of the road by traffic. At the end of this stretch there is a major junction to the right. Here the traffic splits into two lanes although there is barely space to accomodate that. Inevitably the result is no space on the left for cyclists to pass stationary traffic. It's not unusual for vehicles to suddenly veer to the left, in front of riders, despite having just passed that same cyclist yards before. Through the lights the road widens considerably. All of a sudden, now there is space for it, an on-road cycle track starts. Or to be more precise there are road markings on the left designating a section of the road for cyclists. Shortly after that a bus lane appears, so you now have, from the left, a cycle lane then a bus lane, then a traffic lane. I should point out that traffic at this stage is almost always fairly light. I have never seen a tailback on this section. Even when there is a vehicle trying to turn right into an entrance, other cars can use the bus lane to pass. There is no parking on the left. This is the perfect scenario for riding (apart from the increasing gradient - but that's another story!). The way is clear, the surface is good, no traffic is getting in anyone else's way and everyone is progressing nicely. Then, at a point where an exit from a housing development comes from the left, the bike lane suddenly, without warning and for no apparent reason, transfers on to the footpath, behind a row of trees. The first few times I rode this stretch I completely missed the transition. There's no on-road indication of it to cyclists. If you look closely enough you'll find two signs high above any cyclists eyeline, one indicating the end of the on-road lane and another, against a tree, indicating the start of a shared footpath/cycle path. From here cyclists very definitely get pushed to the bottom of the food chain. The off-road bike lane is an obstacle course of tree debris (particularly bad in autumn but likely to cause a puncture at any time of year), signage poles, lighting poles, bus stops, sunken and/or raised manhole covers, pedestrians ignoring the distinctly marked seperation of the paths and, most dangerously of all, traffic coming from the left. That traffic comes from two places. The whole way up is dotted with concealed entrances. Being leafy suburbia most houses are detached with big hedges and mature greenery. There are very few where either the driver, emerging out across the footpath/cycle lane, or the cyclist, trying to negotiate the many hazards in their path, can see the other. Inevitably drivers rarely feel it their duty to allow cyclists pass, when they do spot them, instead driving out and stopping across the bike lane, waiting for a chance to head out onto the road proper. Worse still, there are several road junctions emerging on to Mount Merrion Avenue from the left. The cyclist has gone from having right of way over all of these, by virtue of being on the "main" road, to having no priority at all, by virtue of being on the footpath. Cars coming from the left will inevitably stop/yield across the line taken by cyclists moving from the path section on one side of the junction to the path section on the other. Cyclist must now stop to allow them pass. Finally, the cyclist emerges, panting, at the top of the hill, where Mount Merrion Avenue meets the Stillorgan dual carriageway (N11). The cyclist either turns left onto the (very poor) cycle lane at the side of the dual carriageway or turns right, to try to get onto the cycle lane along the far side of the N11. However, neither of these options is legally catered for. There are no cycle lane markings whatever at the junction meaning that technically, the cyclist is now riding on a footpath which is illegal. Along the whole stretch where cyclists are forced onto the path, the bus lane continues, well surfaced, free from most vehicles, with right of way at junctions and almost unused by buses. I ride this route at least three times a week and rarely have seen any busses at all. I have never come across a situation where traffic conditions would have prevented a bus simply passing a cyclist riding in the bus lane. The Garda was completely within his rights to move me from the safe, free flowing option I had chosen to the hazardous, lower priority option which, at times, forced me to break the law. How mad is that! This is just one of several such legal anomolies I negotiate on my commute. Others include lanes in such poor condition they are hardly visible, let alone ride-able, one junction where a cyclist can't legally turn left even though cars MUST turn that way, a long stretch of shared foot/cycle path where a cyclist can't legally enter or leave the cycle lane and many, many very poorly maintained stretches of road where no lanes exist at all. The regulation quoted above shows how poorly thought out this situation is. For example, subsection (iii) of paragraph (b) only allows a rider to avoid cars parked "for the purpose of loading or unloading". However, most cars parked in bike lanes are there simply because everyone knows that they will get away with it. So according to the law we cannot leave the lane to avoid illegally parked cars, especially where the lane doesn't have an unbroken line on the right hand side (traffic sign number RRM 023!). This situation is farcical. Given that there is obviously no funding or political will to provide proper, safe, free flowing cycle facilities that afford cyclists at least the same priority as other traffic, the only sensible option is to repeal the law that forces a cyclist to use a bike lane whether it is the safest option or not. Riders are already running the gauntlet of traffic, weather and poor roads, they should at least have the option to choose a safe route. Are you talking the cycle lanes on Mount Merrion Avenue with broken or dashed white lines? If so, the garda was wrong. As the regulations say: "(b) Paragraph (a) shall not apply in the case of a cycle track on the right-hand edge of which traffic sign number RRM 023 has been provided,"
According to S.I. No. 273/1998, the "Traffic sign number RRM 023 shall consist of a broken white line". In short: RRM 023 = broke white line. In the regulations, the term "traffic signs" includes painted road markings. Hi Cian, my understanding is the law allows no leeway, apart from the three circumstances listed in the post, broken lines or not. The point is that the law as it stands is unreasonable, inflexible and impractical, not to mention dangerous. Cian, your streetview link is interesting. Even I hand't noticed those signs just after the start of the off-road lane indicating that it ends for the pedestrian crossing and then starts again. According to the letter of the law cyclists must dismount for those few meters. Lunacy! The law is restrictive but it only covers cycle lanes with the correct sign and with a solid white line.